We have to accept that both the victim and the bully are different from the middle majority and for different reasons. To put it simplistically, the frustrations, insecurities, inadequacies, inferiorities of the bully are expressed in an oppression of selected targets so feeble and vulnerable by comparison with the perpetrator that meaningful resistance is almost inconceivable. The bully is invariably a coward, but that is no compensation for the victim who suffers agonies of fear, self-doubt, rapidly diminishing self-esteem and, not uncommonly, pain. Inevitably too, the bully can usually count on strong support from weakminded followers. It is no wonder that bullying sometimes ends in devastating tragedy. Every human being has talents and potential. By concentrating on developing those talents and that potential we can increase self-esteem, we can develop a continually improving selfimage. We can help to replace a person's negative beliefs about themself with positive beliefs in themself. I’ve spent much time researching bullying. My findings and understanding of this problem, coupled with my ability to instil confidence, generate enthusiasm and provide direction have enabled me to help many youngsters escape from victimisation. 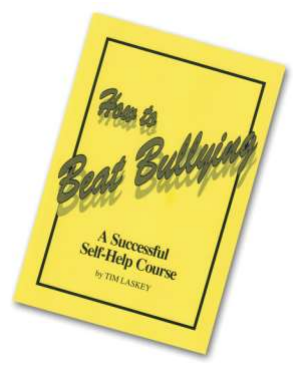 My book “How to Beat Bullying” was endorsed by the Anti Bullying Campaign, was highly acclaimed and widely distributed both in the UK and internationally. I felt I must write and thank you for all the help and encouragement you have given Nik over the past months. If you recall we sought your help because Nik was so distressed at constant “bullying and ragging” at school because of his weight. From the start your enthusiasm made him feel better about himself which has increased over the months. He has become so much fitter and looks so much better and as an added bonus, always a prey to the “dreaded wheeze” he has not had a bout of asthma since he came to you. Once again. Thank you.